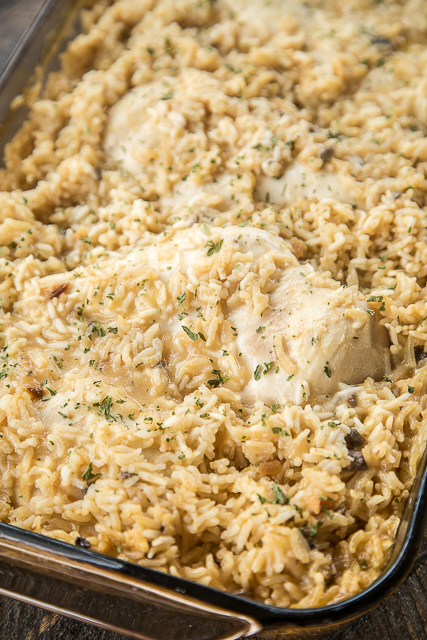 This No-Peek Chicken and Rice Casserole is super easy to make. Just mix everything right in the pan, cover and bake. Doesn't get much easier than that! I used onion soup mix and cream of chicken and cream of mushroom soup. If you aren't a fan of cream of mushroom, you can substitute your favorite cream of soup - another can of cream of chicken chicken or a can of cream celery would work great! 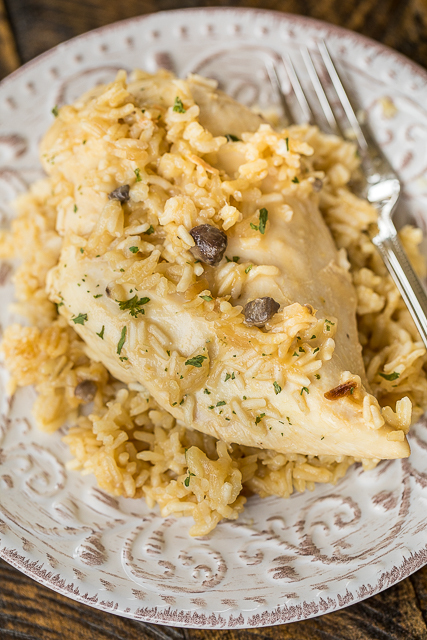 I used regular uncooked rice in this No-Peek Chicken and Rice. I know some of you like to use brown rice. I haven't made this with brown rice. I am sure you can use brown rice, but you will need to tweak the baking time. Brown rice takes longer to cook than regular white rice. 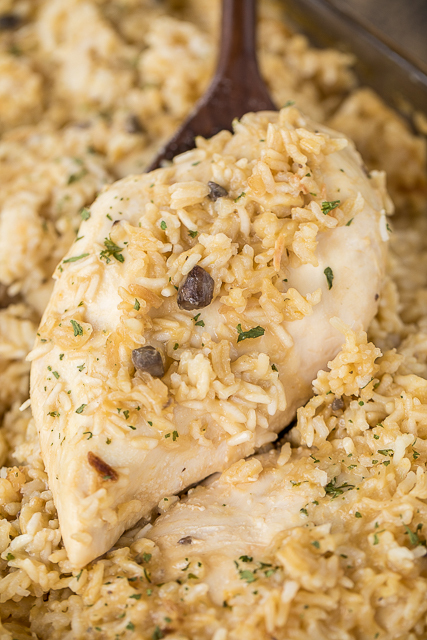 This No-Peek Chicken and Rice has become our go-to Sunday dinner. I love that I can just mix it up, pop it in the oven and forget it! We serve this with some green beans or lima beans. So easy and SOOOO delicious! Preheat oven to 350ºF. Lightly spray a 9x13x2-inch baking dish with cooking spray. Place chicken on top of rice mixture. Cover tightly with foil and bake for 1 hour 15 minutes to 1 hour 30 minutes. This could be a silly question but can you use brown rice? You can BUT it will take longer to bake and you might have to tweak the liquid. I tried this using one can of cream of mushroom and one can of the golden mushroom soup. It was delish. I've made this for years. A friend had it as a main course st their Tea Room. I tweak the flavors every time I make it by adding things I find in my refrigerator. I have added sour cream, mushrooms and/or chopped up dried beef. You just have to make sure you have enough liquid because the rice can dry up quickly. My friend used to take the left overs and add a cream base to it and make chicken and rice soup after she chopped the chicken in smaller pieces. Much sour cream did you add and when did you Add it? This is a family favorite! I use 1can Cream of Chicken & 1 can Cream of Celery! In the picture, there appears to be parsley. Did you add this to the dish? I just sprinkled some dried parsley on the dish before I took pictures. Can you use instant rice? I haven’t tested this with instant rice. If you try it, let us know how it turns out. I always use instant rice, just decrease your cooking time to one hour. I grew up eating chicken and rice which was simply...boil the chicken...debone the chicken...use the chicken water to cook the rice in....put the deboned chicken into the cooked rice and serve. It is so yummy!! With that said, this recipe sounds really good too. I will definitely have to try it. I love fast, easy recipes like this. Thanks for sharing. Did you add capers? What is on top? 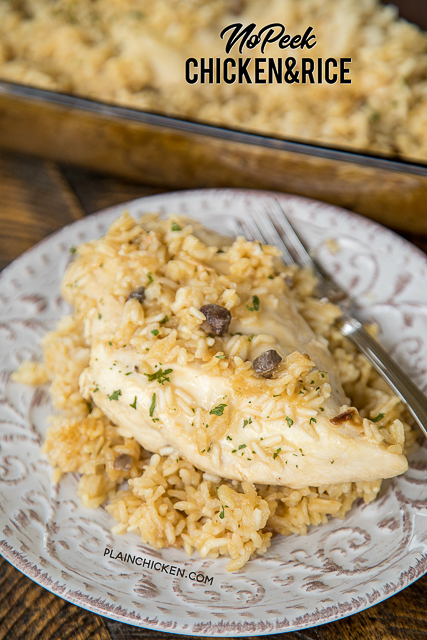 Ridiculous question: Do you cook the chicken breasts first or do you put them in raw? Put the chicken in raw. It sill bake with the rice. Enjoy! I'm cooking it right now. I hope it turns out yummy. I think I may need to add more broth or water. I don't like to change recipes, but I am trying to find a good chicken rice casserole this sounds perfect. Only thing is I don't want to make a trip to the store and I have everything but the onion soup mix can you substitute something for that? I use minute rice and just one can of water. I like to use cream of chicken and cream of celery. how much minute rice did you use? Husband is not a fan of wild rice. Could you use chicken tenders instead of chicken breasts? Can you use chicken tenders instead of chicken breasts? Absolutely! But unfortunately, without further recipe testing, I cannot give you a cooking time with certainty. As always, please use your best judgment regarding substitutions and modifications. Is there a way to do this in a slow cooker while I am at work? What a great idea! I am sure it can be done. But unfortunately, without further recipe testing, I cannot answer with certainty. As always, please use your best judgment regarding substitutions and modifications. This looks delicious! Do you add the water as recommened on the cans of soup or just the contents of the cans?